Ugghhh! Mobility. I always hear “I hate mobility, it hurts,” “Mobility doesn’t help me out.” Well it does hurt and it’s not an instant cure. It is preventative maintenance. It helps to solve pain issues, prevents injuries and optimizes athletic performance while developing kinetic awareness. Think of your body as a very high performance sports car... Would you take that sports car and start it up and right out of the gate; put the pedal to the metal before it was warmed up? Probably not, so think of your pre-WOD routine: Do I warm my engine up for the high performance that I expect from my body? You should be thinking about what the workout is going to be and what you need to mobilize for that WOD to optimize your performance. Once you have developed your pre-WOD mobilization it’s time to get that engine going at full performance. Let’s think of our sports car as a manual transmission. It has 1st, 2nd, 3rd gear and so on for the different speeds at which it runs. If I am going to do a race with my car for speed and performance, I need to start off in the right gear. What happens if you start off in 3rd? You stall the car and it dies. Our bodies need to be in that right gear from the very start. Here is an example, you hear Coach Gil say “get organized!” He is telling you to get in that right gear, get your glutes tight, ribcage down, belly tight and your head in a neutral position. This is your 1st gear. Midline stabilization (1st gear) works in conjunction with torque (this is your 2nd gear) to establish force in our primary engines. So how do you do this? You have heard the cues “screw your feet into the ground” or “shove your knees out”. This is to create torque with a stable hip position. Break the bar, armpits forward... these are for torque and stable shoulder position. Now you’re moving, 3rd, 4th, and 5th gear. Steady and fast, your car is moving at top performance. You reached this point by taking the proper steps in mobilizing, warming up and establishing kinetic awareness. You hear your coach yell out “Time!” You’ve just finished the race, or workout in our case. Now your car is at idling, the engine is still hot. You need to cool that engine down before you shut it off. This is where post-WOD recovery begins. Your body is still warm and you can now work on some soft tissue mobility. 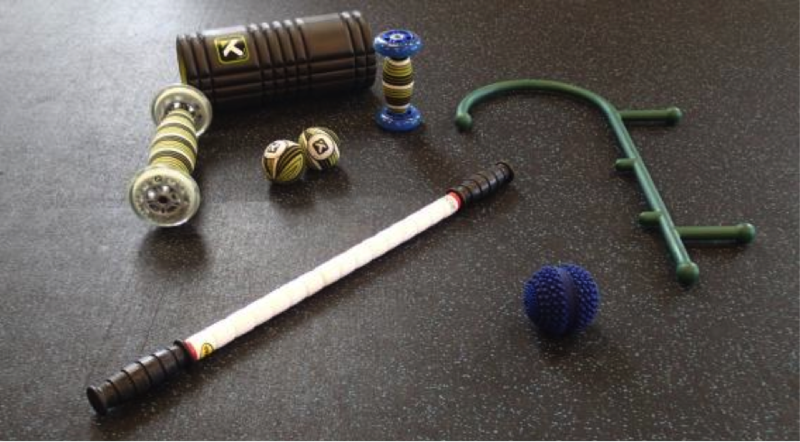 Use the foam rollers, lacrosse balls, soft balls and barbells to smash the soft tissue. You can even use your buddy to help perform a buddy smash in areas like the quad, hamstring, adductors and even your forearms. These are just a handful of things that you can address. Find the areas most affected by the workout, and address them. Mobility is not a one time fix. It must be continuously performed in order to see improvement. I recommend doing it every day at a minimum of ten minutes. Concentrate on areas that you feel need improvement for establishing range of motion and proper position. Then, work on areas that you have been working the last few days to help loosen up that tissue that may have been matted down and stiff. Lastly, do a free for all to search out areas that haven’t been mobilized in a while. Take the time and play with mobility, you will be amazed at how your workouts will improve, as well as your everyday life. Oh yeah! Drink plenty of water to stay hydrated, keep that car nice and oiled! Here are my top six mobility movements to help with your preventative maintenance. Visit these sites for more mobility movements and information on mobility.